I was born in Leningrad. When the War began I was eleven, and so I remember almost everything. My mother reached an age of 90, she was born in 1902, and my father in 1904. My father was at the war, and my mother stayed in besieged Leningrad. She suffered dystrophy. My father had lived in Leningrad since pre-revolutionary times. He remembered that when he was a boy my grandmother worked for the masters as a cook, but he couldn’t live with her, and so he, a boy of 12 or 13, livedalone somewhere else. As to my mother, she moved to Leningrad in the late 1920s. She was born near Vologda and then her family lived in Petersburg province, not in St. Petersburg itself. My father’s name was Vladimir Ananyevich, an uncommon patronymic. He didn’t remember his father who died when he was a boy. 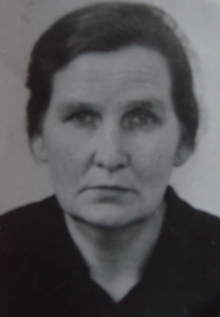 My mother, Antonina Ivanovna, — here is her photo — finished her education or maybe she didn’t quite manage to finish at gymnasia in Pskov before the War. She worked at a shop selling musical instruments on Nevsky Avenue. My grandfather, Ivan Davidovich, my mother’s father, was dispossessed as a kulak in the 1930s. He was Latvian by origin, but already russianized: he had left Latvia when he was 17 and since then lived in Russia. He had a farm near St. Petersburg; in 1912 he had the opportunity to take a loan from the peasant bank, and before that he worked for a prince as a steward. He had clever hands and built a house and set up a household. My mother told me that when the 1920s began their family was safe, because before the Revolution a revolutionary had been hiding on their farm for some time. No one of grandfather’s five children was connected with Latvia. My grandmother was Russian, from Vologda. Their three sons left for work in Petersburg. Grandfather was too old for a collective farm and was dispossessed of his land and farm. All his three sons, my uncles: Ivan, Vladimir, and Victor, were killed near Leningrad during the Great Patriotic War. My grandfather died before the War, and I only saw him once. One of his sons went to bury him, but my mother couldn’t go because she was pregnant with my brother. My father worked for perfumery «TEFE» (Trust of Ether-Fat Essences where perfume was made – translator’s note). I don’t know what he did there, but our house always smelt of perfume essence. In 1941 he was 37. He had already taken part in the Winter War in 1940 and I remember how the windows were blacked out at that time. My brother and I saw our father off at the beginning of July 1941 when he left to fight. At first he was at the Leningrad Front, then at the Northern one on the border with Norway where there was fighting too, because Norway was under occupation by the Germans. In June 1941 I was on holiday with my parents who were renting a dacha. There is a place on the Gulf of Finland called Fox’s Nose. We came there in June, the beginning of summer. It was Sunday, and my father arrived and we went for a walk to the Gulf of Finland. It was sunny day, but windy, so we didn’t bathe. When we came to the shore people were telling each other, “Molotov is saying something”. We went back. There was a pole with a loudspeaker near the house where we were renting a room, and people gathered round it to and listen to Molotov’s communication about the war. My father immediately returned to the city. But we stayed because we didn’t know yet what to do. We thought, if we had survived the Winter War, we would survive this one. My father had to go to the military commissariat, because he was still of call-up age. In the house next door my godmother lived, and my aunt, my father’s sister. She said we must go back to the city because the electric trains were overcrowded (she lived nearer to the station). I remember it was rather cold and I put on somebody else’s long-sleeved jacket. We arrived at Warsaw station and then went on foot. It was still bright and there were white nights. I saw windows pasted criss-cross with tape and paper, and in the sky the first barrage balloons. Everything looked so strange to me. It was the first impression that life had changed. I started school at the age of seven and a half. Before the war began I had already done four years. I even have some pre-war photos taken at school, very funny, in the first form and the fourth form. When the War began we were about to begin our fifth form, but we didn’t, because nobody studied during that 1941-1942 school year. The fourth form in which Galina V. Rakov studied before the war. Major concerns and industries were evacuated, and families left with them. My husband’s mother was a doctor and she was under military command so she sent him to be evacuated alone with his school. It was still July, and the blockade hadn’t been tightened yet. I remember that my friend left with Maryinsky Theatre where her mother played in the orchestra. We felt adrift: my father was far away; my mother phoned him and asked what to do. He said: “Well, we survived the Winter War, after all!” And there was nobody we could turn to. So we stayed in the city during the blockade. Those who were registered at school could be evacuated. But only the children could leave. Their parents had to stay in the city. Later when the situation was getting worse, the whole family might be sent out. Everyone understood that if children were evacuated alone, they could hardly survive. Bombing began in September. The first bombardment was on the 8th of September, or the day before. I remember, it was a moonlight night, and the six-storey building nearby was bombed and the all windows shattered in our building. People’s groaning was heard. People were being dug out from the rubble, and our building was fenced off the next day. Girl medical helpers from air-defence were digging survivors out. Some wooden partitions stuck up out of the bombed building, and people came to saw them up for firewood. My brother came too with a small saw. Whenever there was bombing we went down to the cellar that served as a bomb-shelter. The cellar had been cleared of firewood (our block was heated with wood) and when we heard the bomb alert on the radio at night we went downstairs in the dark from the fifth floor to this cellar and waited for the all clear. We took biscuits and our documents with us. I remember, sometimes one raid had scarcely finished, when another began, and then another one, and again, one after another. Later we could not go down because our strength was failing. We realized that the building could be bombed with us in it, but what could we do? Food didn’t disappear at once and there were some cereals and potatoes. People realized that it was war, so they laid things in. I remember how I was sent to the shop; people were not used to such huge queues and the shop was crowded as never before. And I remember tins of crabs! Now crabs are a delicacy, but at that time people preferred herring and didn’t buy crabs. Then the kinds of food on sale were limited. Food-cards were given out according to age. Workers got the card for workers, state employees the cards for state employees; my mother had such card, my grandmother had the card for dependants, my brother and I the cards for children, later the card for dependants. Gradually, I think, by November, we came down to 25 grams of bread instead of 150 grams. Then winter began, and terrible cold was added to this hunger. We lived on the fifth floor without a lift. 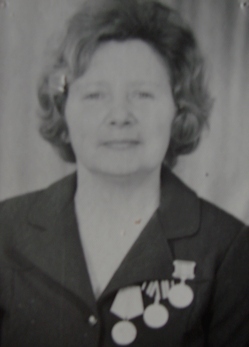 My mother worked in a small department “under martial law”, and she was on duty round the clock. At that time my grandmother Pavlina Sergeevna was still lving. She died of starvation. I remember her dying. When she died in January 1942 she was not buried for a long time because we wanted to use her food-card. That was a very cold winter, about 40 degrees below zero, and it was cold everywhere, in all the rooms, and in the kitchen. My brother and I lay under blankets because of the cold. We lay in coats and warm caps; we had to get warm somehow. The windows were closed up with wood veneer because the panes had been shattered long before, and we waited in that cold for our mother to come home. Later I went to get bread and stood in the queue myself. People in the queues had rugs, some people had blankets; everyone was dirty because only wick-lamps were used for lighting, such metal cans threaded with wicks. At that timeyou were considered a child and were given the children’s food-card up to the age of twelve. There was neither water, nor electricity. There was no way to pipe water in, but there was water downstairs, in the cellar, and there were taps there, so at first we went to the cellar to get water. Later we went to another street for it, as the water in the cellar had frozen because of the hard winter. There were queues for water. But how much water could we bring in a jug? We, city-dwellers, didn’t even have buckets. My aunt and I (we lived together) went several times to get water from the Neva. Somebody helped us to draw it out and then we sledged it back home. In this way the water we could have was limited. We had a small stove with a chimney, and we had to stoke it with something. When my mother could still walk she bartered things in the market in order to get at least a cup of cereals or a log of wood. We didn’t leave by the Road of Life, because we were afraid of freezing to death in the open cars; and we decided to go by barge in the spring, when Ladoga would have thawed. We had already got our passes for the barge, and prepared small bags made of pillowcases, and we were ready to leave, but there was a storm on Lake Ladoga. The storm lasted for five days and barges were not allowed to go out for fear they would sink. At this time my mother fell seriously ill, and even had a swelling on her head, so she was taken to the military hospital. At that time they were not civil hospitals, but military hospitals on the sites of hospitals. There was a military hospital in Maryinsky Palace and we, schoolchildren, recited poetry to the wounded. Not only servicemen stayed in the military hospitals but also victims of the siege. My mother stayed there for six months. We were supposed to be sent to a children’s home but my aunt got custody of us to prevent us from getting lost in different children’s homes. My mother was very weak. Once orderlies were even about to carry her out. She was treated with bacteriophages as pills were of no avail, because it was advanced stage of the disease, bloody diarrhoea. After treatment she got better, but before she had looked like a skeleton. Later I saw in her employment record book that she had been written off because of her long period of illness, and she was no longer in the worker category. Rubbish was thrown into the street, and people who were too weak to come down threw it out of the windows. Others carried it out and the stairs were dirty. There was a lot of snow and the streets were not swept. I could see a man sitting right beside our porch, stiff with cold, and it was already impossible to move him. Since the streets were not cleaned we feared an epidemic could break out in the spring. If you had a mark on your card, anyone who could hold a shovel was to clean the snow. People had to work cleaning the city in their free time. An edict was issued and everybody worked to clean the city. In spite of this our working hours were not shortened, of course. The workers were mainly women. Leningrad survived owing to women in their forties, as teenagers couldn’t bear the hunger. The old who weren’t able to fight at the front did what they could, but mainly women worked. Twenty year old girl medical helpers from air-defence carried out the dead and took children who needed to be fixed up somehow after their parents had died. They went round the flats to check if there was anybody alive. Our six-storied building was almost empty. In March 1942 a tram ran. That was an occasion! Public transport was not working and people went everywhere on foot. For example, a person working in the Kirov Plant might have his family on the other side of the city: telephones didn’t function and so he didn’t know if his family was alive and his family didn’t know if he was alive or not. In the spring of 1942 we were given cards for bath houses. We had a bath house but it didn’t function. At last bath houses were open again in spring. But not everyone could go there, only those who had cards were let in, as many as there was room for. Usachev’s bathhouse was in our district and we used to go there with my mother.So we came and got undressed: everyone was bony, and had yellow skin. We all bathed in one room. There wasn’t much heat, but it was not cold, and you could use two or three small tubs of hot water. The room was divided into two parts: women on one side, men on the other. A visit to a bath house had cost about 10-20 copecks (a small unit of money in Russia; there are 100 copecks in a rouble – translator’s note), but at that time people could use it free if they had cards. As I’ve already said, we had difficulties with water. Piped water would not come up to our flat, and I had to take care of my eight year old brother. When it was warm I went outdoors to do the washing. The water from the manhole was clean and I took a basin and did the washing in it. At that time our street was paved with cobblestones, not tarmac, and there was green grass. Then I ironed the clothes because they were full of lice as we couldn’t wash ourselves. 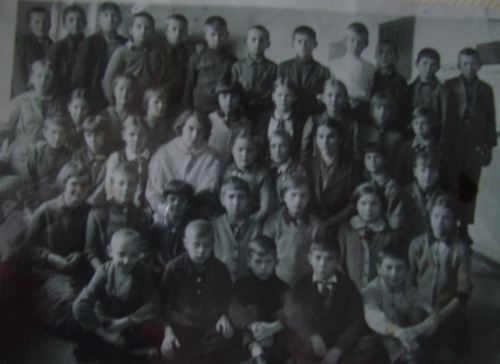 In May 1942 we, the children who lived in our district, were gathered to go to school for the new school year. Our headmistress was Anna Ivanovna Balandina who since has become a famous pedagogue in Leningrad; our head of studies was Victor Eugenievich Kostin who taught us Russian and Physics. May they rest in peace! In September we came back to the building of our former school. There was a large stove in the classroom. In the winter we wore coats in class and our ink froze. We came to the stove to warm our hands. We were all hungry. At school we were given soup of khryapa (green leaves of cabbage) and also cheese cakes made from the waste of seed-oil production and called “shrots”, and we decided they were “sprats”. Actually they were cakes of soya and green fir needles. At school we studied as much as we could but it was difficult to use our brains. There was no paper. We had no new clothes, and we grew. The military commissariat gave me boys’ boots: different things were brought for the families of the military and they gave what they had over. Those who could sew altered their clothes. My brother was given a chocolate bar and a pair of boots. The boots looked smart but turned out to be made of pressed cardboard and when my brother started to wear them they got soaked. There was also a blue shirt, very good, and it suited him. Do you know what we wore at school? While our teacher taught us, we knitted homemade slippers of strings and pieces of cloth. What could we do if we had nothing else to wear?! We made footwear of quilted jackets too. And I had such footwear: it had fur on the upper part and I thought I had very nice boots. The day there was a break in the siege on the 18th of January 1943 was important for me personally because it was my birthday too; I had reached the age of thirteen, and my brother was ten. We said that we would survive as the siege had been broken. But the siege was only lifted in 1944. When it was lifted people still couldn’t come into the city, and they needed to be called. Some children who had left and whose parents had died could never return to Leningrad because they had nobody to call them. Maybe they came back later as adults. My mother came back from the military hospital in 1942; she was still very weak and she had no employment. My brother and I tried to bring her a piece of a sweet or something else from school to support her, for she had the food-card for dependants. So she stayed at home and as she was literate and could write well she wrote some certificates for the housing office. At that time house managers were uneducated. She worked from our house in order not to go far as she had bad legs. Later she worked for a refrigerating plant as an accountant. Workers there were given pieces of butter. My mother gradually recovered. In 1943 I went to the allotments (my mother was ill in bed). Going to the allotments meant a chance for us to eat at least some carrots or something else from the field. The forewoman measured the area we had weeded with a pedometer and wrote down for each of us whether he or she had fulfilled the plan or not. We were taken there by the river Neva behind the Okhtensky Bridge and arrived on the right bank of the Neva in front of Izhora Plant. The Germans were just three kilometers from that place. I was awarded the medal “For the Defence of Leningrad” as an active participant in farm work in 1943. We weeded long, never-ending seedbeds, picked the crop. The Nazis fired at Izhora Plant and some people died there. Near our position there were nets in the Neva because mines and corpses floated from Lake Ladoga; and the nets caught them here. Once we went to wash there – we used to wash ourselves in the Neva – and the body of a Red Navy man in a striped sailor’s vest was floatingthere; we didn’t go to that place any more. The Nazis were opening fire near where we were and we cried: “Mummy, I want to go home!” We thought they were advancing on us. They usually started shooting at night. It’s horrible to think of it: 13 to14 year old children and only one adult with them. We lived in a rural club that used to be kirche (“kirche” means “church” in German – translator’s note) as there had been a German suburb there. Both on the ground floor and on the second floor, and in the loft, there were wooden floors, and we stuffed mattresses with straw and slept there. At night there was gunfire. During the siege Maryinsky and Alexandrinsky Theatres left Leningrad. During the war the building of Alexandrinsky Theatre was occupied by the Musical Comedy Theatre which is now situated in Italian Street. The building of Alexandrinsky Theatre is the biggest theatre building in St. Petersburg. Soldiers from the front who had leave for a while went there to watch operettas. And we girls stood near the bakery and sold the two croquettes we got at school for ten roubles, then bought tickets and sat at the very top. There was “Silva,” and the operetta “The Sea Spread Wide” was performed for the first time. Girls collected photos of Kolesnikova, Kedrov, Mikhailov, and showed them to each other in class. There could be a part in the operetta with dancing and the main heroine was performed by soloist Peltser. She danced really well and I remember that she always got a lot of applause. Later on the radio I heard arias from “Silva”, “Mariza”, “The Sea Spread Wide”. The cinema functioned too. We watched pre-war films in the cinema “Udarnik” in the Sadovaya Street. I can remember “Hearts of Four”, “Timur and His Host”. But when there was a bomb alert everyone had to leave the cinema, we all went out and took shelter in various places. If the all clear came soon we waited for the film probably to continue. Twice I came under fire. The first time was in a tram. I was going to have my photo taken for my Komsomol membership card. The photographic studio was on Nevsky Avenue. In 1943 I was thirteen and I was accepted for the Komsomols although it was supposed to be from the age of fourteen. But all my classmates were already fourteen and I was included because I was born in January. The tram number 13 or 14 was going along Sadovaya Street. The bombing began and we had to leave the tramcars. People took shelter in any of the nearest buildings. During the bombing one bomb dropped not on the place where I went but on a group of firs, and a woman was carried out on a stretcher. She was wounded and her leg was bleeding. The second time I was crossing the Lieutenant Schmidt Bridge and the bombing began. The conductor said, “Leave the tram”. But where could we hide on the bridge? It was summer and we lay down right on the road. When you’re lying there is only the sky above you. It was frightening! Somewhere far away there were ships and bombs were being dropped into the Neva and the water heaved like the fountains in Peterhof. And you think that at any next moment a bomb could hit you. In May 1945 we ran out on the Sadovaya Street and rejoiced that the War was over. It was Victory! In June the troops returned from the Leningrad Front; they marched ceremoniously through Palace Square with banners. My father came back at the end of 1945 while my brother Boris was still alive. He died still a child in 1946. They unloaded tank mines after school, played, poured out the powder. But in Ligovo nothing was taken away, and boxes with shells and mines were almost within the precincts of the city, and also near the allotments. They said at the checkpoint that children went to the allotments to their mothers. There were five more children with my brother, but it was only he who died. The other boys were afraid to tell us about it. Then they told us. Boris was reckless. Our family was given an allotment near the Mitrofanyevskoe Cemetery. My father worked for the Kirov Plant after the War, and probably he was given this allotment by the Kirov Plant. The cemetery was old and neglected. People were not being buried there and we had some carrots growing in a couple of seedbeds there. But it was so far to go! While the carrots were too small we didn’t pick them, but when they grew bigger they were picked by those who lived nearer to the place. Somewhere on the roadside cabbages were growing but they never came to be cabbages. We cooked soup of the first green leaves that don’t even form the head of cabbage (they were called “khryapa”). I remember that I picked the leaves in sacks and my father carried them home. I happily finished 10 years of school in 1948, got excellent and good marks. I graduated with distinctions from Leningrad State University, Chemical Faculty, and finished post-graduate study. In 1958 my husband and I moved to Moscow, where I’ve worked for 50 years for the Institute of Chemical Physics as a senior researcher. I liked my chemistry teacher at school. She could teach lessons skillfully, and won our hearts, because it was so interesting to listen to her. However, looking back, it seems that everything then was in very short supply and maybe a chemistry laboratory should be better equipped, and we had very little. At that time technical sciences were more popular, chemistry, physics, and not philology. We went up to the university as we thought higher education was the best thing for us. Some of us studied medicine, but I was afraid of it, surgery, performing operations. I wasn’t attracted to medicine. I was awarded the medal “For the Defence of Leningrad” in 1943 but at first I wasn’t counted because I needed a confirmation that I had worked somewhere. I wrote to the record office where I knew I worked, but I was told that the documents confirming that our school had worked there had not been preserved. Nowadays if there is confirmation that a person worked during the siege, he or she is considered a veteran and the pension is different. My friend was fourteen and to get her the worker’s food-card because her mother employed her at the post office to sort letters. And she has saved the certificate to confirm she worked for the post office. And I have my certificate from the record office that I worked and did my stint. It is said in the edict: if a person worked at least a day during the siege, from the 8th of September 1941 till the 27th of January 1944 and has the medal “For the Defence of Leningrad”, then he or she is considered a veteran. After the War one of our friends told us that he came to the district executive committee and greatly surprised they said, “Are you a siege-survivor? They are all in Piskaryovskoe Cemetery”. Such disrespect for those who survived! Other people came to the city, who hadn’t suffered all the hardships of the siege of Leningrad, and they got jobs on the district executive committee. And the newcomers got flats faster, while the siege-survivors didn’t get anything. Our house has survived. If I could have had a private flat at that time, I would have the flat where I was born, but unfortunately at that time I couldn’t do so. Now some other people are living there. I wonder how many of us residents were in the city when it was under siege. It’s very difficult to count how many residents died. When the Nazis began to advance all the people from the suburbs, Pushkino, Pavlovsk, fled to Leningrad. How many people had come? How many had died? Sometimes the dead were thrown into trenches just in sheets. My grandmother was also carried to the so-called “piles” and then loaded like firewood because there was no place to bury people. In our institute there was a man who fought near Leningrad, and he said that it was impossible to dig the ground in Piskaryovskoe Cemetery. It was bombed and the bodies were thrown into the trench. Horrible! In what conditions the siege-survivors lived! Maybe there are some people who did not suffer so much on the front as we did in the city during the war, if there was no hunger, but only bombardment. But when there is such hunger and such conditions. Now I think: “God, how did we survive?” This period of my life seems remote, but it is so important!